I really don’t know what to call this or even what it adorned. The center panel is a lovely and unusual eyelet trim. The edges of the trim are actually embroidered as part of the eyelet and not a separate piece. It would be wonderful to be able to buy yards of eyelet trim like this now. Notice how carefully the trim is cut along the bottom edge and sew into place by hand. The mesh lace with the ruffled edge is carefully pleated and sewn by hand nicely overlapping the ruffles at the top. I think it is the top. Even though the lace feels frail there are no holes developing as yet, and the few spots soaked out in oxyclean. I love that stuff. 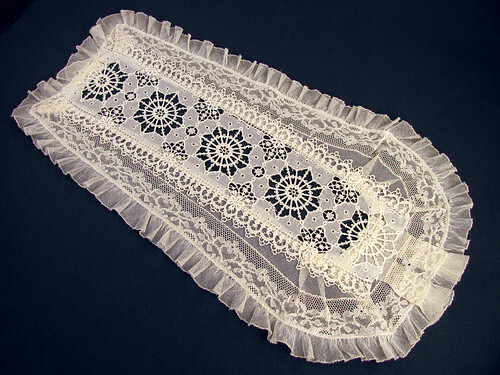 I started writing about these old pieces of lace to give me more time to catch up with my crafting. It seems that cleaning and organizing all the bits and pieces is taking more time than I anticipated. It needed to be done sometime, so now is as good as any I guess. I am cleaning as much as I can and wrapping everything in preserving tissue. I ordered the tissue a long time ago after taking a textile preservation class at our local natural history museum. I am getting to work on some of my craft projects. I have 260 of the 400+ yoyos I need for a bag. That is a little progress. 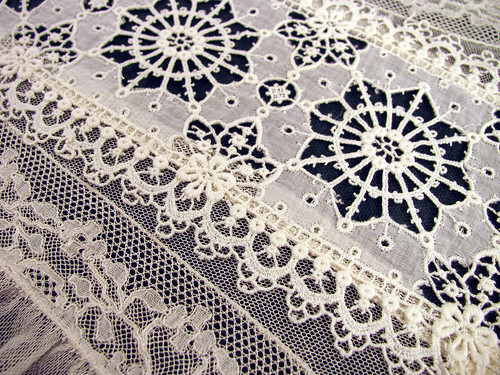 A close up photo of the embroidered eyelet trim. This entry was posted on Friday, March 20th, 2009 at 3:00 am and is filed under Lace, Sewing and Vintage. Tagged: Fabric, Lace, Needlework, Sewing, Thread, Vintage. You can feed this entry. You can leave a response, or trackback from your own site. That is extremely pretty lace. I haven’t done much work with Lace, I think I am a little afraid of it. Whoever made that did very good work.